This week I am much more into the swing of things… I am getting my workout going, and I’ve gotten back into the swing of things with work. 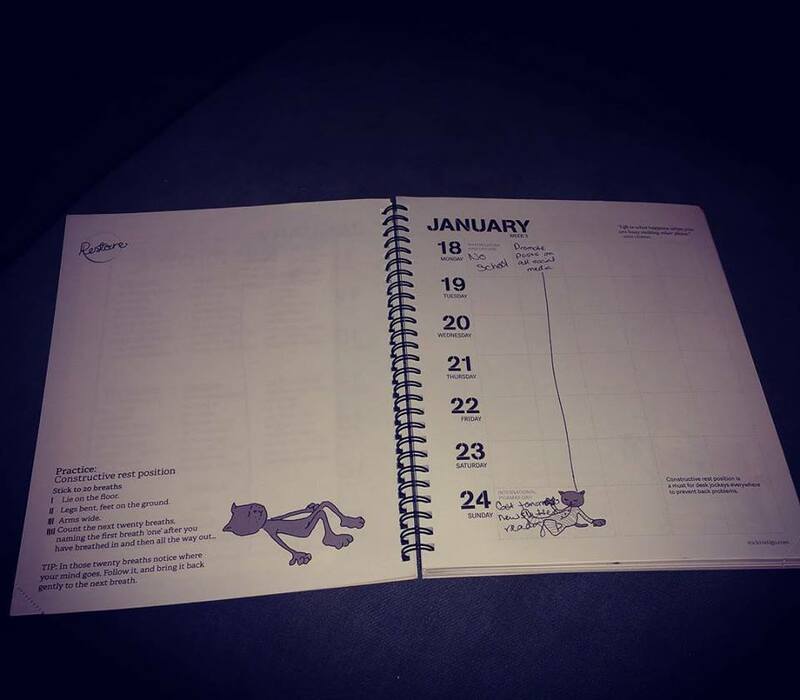 Right now, I am just attempting to get myself back organized with my new planner from Stick To Stigu. I wouldn’t say that I am a completely unorganized person, I actually do fairly well, but since my schedule is so simple, I tend to get a little on the lazy side when it comes to jotting things down in my planner. I mean, should I really mark off 7-3:15 for work everyday… The answer is YES, I should. I should, and I should consult my planner when I make appointments. I have dedicated this week to getting everything marked off in my planner so that I don’t have any mishaps with appointments and I can take less time off work. It works out better, and I am LOVING it. Plus, seeing that my schedule isn’t actually completely free makes me feel a LOT more productive! Now, I know that a lot of people love their phone calendars, and I do too, but I NEED a paper planner. There is something about actually writing appointments down that helps me to remember them. My planner of choice this year is from StickToStigu. While no planner is perfect, I think this one is pretty close to it. I love the blank pages that it has that have suggestions and exercises for you that spark your creativity, and I love that it has inspirational quotes each week. 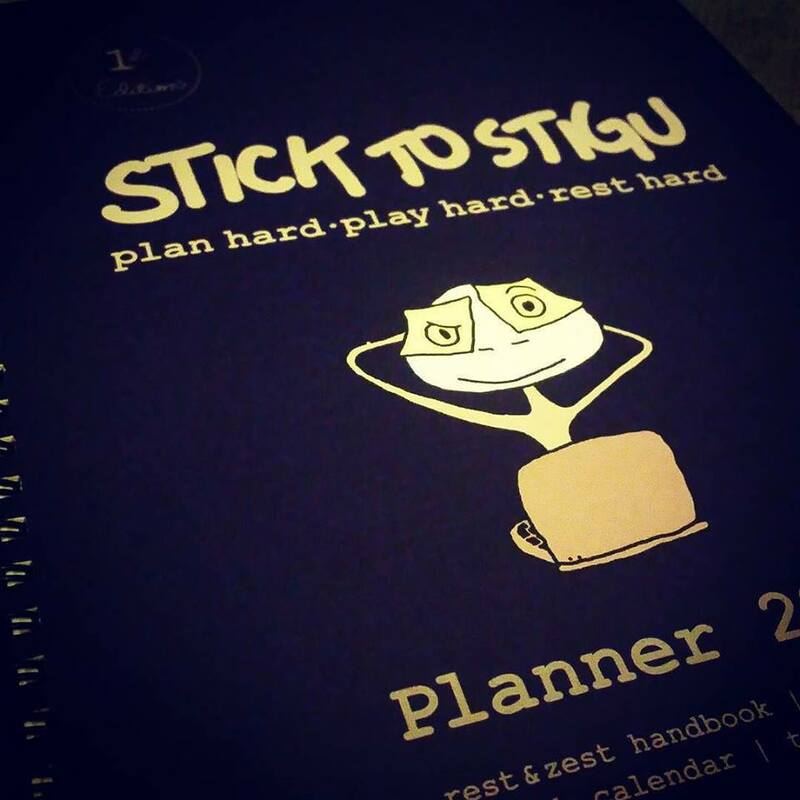 If you would like to get your own Stick To Stigu planner, you can do that here. 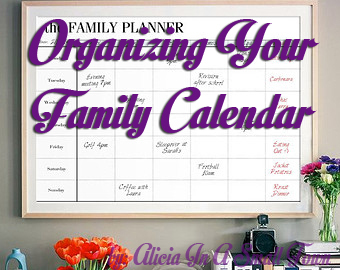 A family calendar is the best way to coordinate all the comings and goings of every single member of your family, and to make sure you aren’t, as a whole, spread too thin, and get enough family together time. That’s why this week’s challenge is organizing your family calendar and to keep and actually get in the habit of using it on a daily basis. This is the perfect time of year to begin this challenge because the New Year is almost upon us, and you may need a new calendaring system for the coming year anyway. So, while you’re in the store buying a new calendar (or making something you’re personalizing for yourself) keep the following steps in mind to get the most out of this useful tool. Are you new here? This week’s challenge, all about keeping a family calendar, is one of the challenges in the 52 Week Home Organization Challenge. (Click the link to learn how to join us for free for future and past challenges if you aren’t already a regular reader). 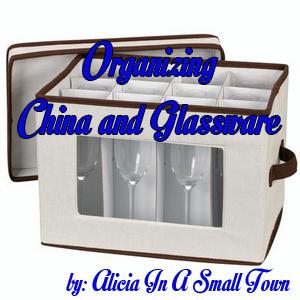 This week’s challenge is organizing china and glassware, to keep it clean and safe for your use. Some people have a couple of sets of china and glassware, including an “everyday” set and also a nicer set reserved for use for special occasions, that you may have received as wedding presents. After all, there is no point in owning nice things if you don’t occasionally use and enjoy them. Your challenge this week is to work on organizing Christmas decor and storage so you can safely store, and then find and display the items you love and get rid of the rest. Obviously you aren’t going to store your holiday decorations until the season is over but I scheduled this challenge for a couple of weeks before Christmas, because there are really two parts to it. First, we’ve got some work to do now, while your favorite decorations are out, to declutter what you don’t want anymore, and to gather your storage supplies for later (that will be steps 1-3 below). Then, second, after Christmas is over there’s a bit more work to do, because then it’s time to store the decorations away until next year (that will be step 4 below). Are you new here? 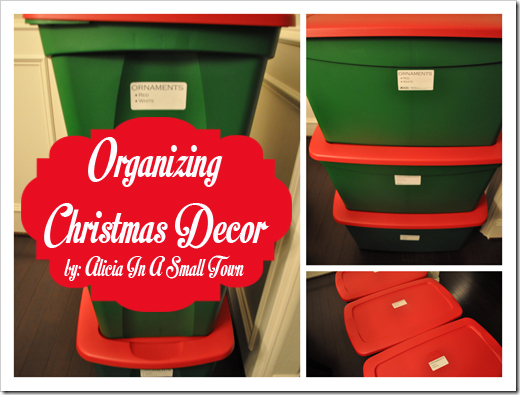 This Christmas decoration storage and organization challenge is part of the 52 Week Home Organization Challenge. (Click the link to learn how to join us for free for future and past challenges if you aren’t already a regular reader). As you get your holiday decorations out this year to put up, it is the perfect time to declutter and get rid of items you no longer need, want or cherish anymore. We’re slowly, through the course of this year of challenges, going to declutter every area of our home (including stuff in storage) and these sometimes sentimental items are no different. It can be tough, however, since we can have an emotional connection to some items, especially our Christmas items. The items listed below are the prime categories of decorations you should declutter from your home. You can donate anything that others may want to use, and this can help you feel better about parting with some of these items. However, please don’t donate broken or trash items, but instead just throw them away. Broken items beyond repair (or that you realistically will not take the time to repair), such as ornaments, strings of lights, etc. When decluttering really try to keep only the cream of the crop of your Christmas decorations, and ditch the stuff you don’t love or even like very much. You don’t have to cram every surface with decorations to show your Christmas spirit, and your storage area will thank you for it 11 months out of the year! Another thing to keep in mind over the course of the upcoming year is that you’ve got decorations that you traditionally put up for other holidays as well. When you’re dealing with them, during the season you’re displaying them, is the perfect time to organize and declutter that holiday’s stuff. So use the same principles as discussed in this article when dealing with Easter, Halloween, Thanksgiving decorations, or seasonal decorations like the wreath you put out each spring, for example. Once you’ve got the cream of the crop left, the next step is to take a quick and dirty inventory of what you’ve saved. You should write down the broad categories of items you’ve got left, the number of items, approximately, and how much space they will fill in your storage containers. The purpose of this inventory is merely to make sure you’ve got a place for all your Christmas decorations in storage for the majority of each year, so don’t worry too much on complete accuracy as much as reasonable guesstimates. Christmas dishes: quantity, types of dishes, cups, serving pieces, etc. Once you’ve got a reasonable estimate of the decorations you’ve still got take a hard look at the containers you’re storing everything in to see if you need to improve how you’re storing everything. These are all just suggestions and best practices. I’m not suggesting you go out and buy lots of storage containers or other items if you don’t need them, or can’t afford them. But, as you have an opportunity, or over time, these are good things to keep in mind. Each box contains the same category of stuff, such as one container each for lights, ornaments, other decorations, etc. Until you place your decorations into storage at the end of the holiday season you won’t be able to fully know if you’ve got all the Christmas storage solutions you need. However, the inventory I suggested you make above should help you identify any major areas you need to deal with, and give you time to get the right storage containers (or make something yourself) before you’ve really got to store everything. If you’re using cardboard boxes for storage think about replacing them with something more sturdy, such as plastic Christmas storage containers instead, since they are better for stacking, and keep the items inside more protected. Make sure you’ve got enough tissue paper for wrapping ornaments, or use ornament storage boxes with divided containers, which are designed to keep the decorations from clinking together in storage and potentially getting damaged or broken. There’s nothing worse than trying to untangle Christmas lights when trying to put up your Christmas decorations, so to help yourself next year wrap your lights around a homemade Christmas light storage reel, or buy one to make it easier on yourself. Some items are too big to fit in boxes, like an artificial tree (unless it is disassembled) or a wreath, so consider getting items designed specifically to store these things such as Christmas tree storage boxes or bags and wreath storage containers. The final step of the Christmas decoration storage and organization challenge can’t be done until after the holidays are over, but your preparations from steps 1-3 will make it an easy process. Once the season is over and it’s time to put everything away, go ahead and place everything back in the boxes or other storage containers you’ve designated. Separate the decorations into the major categories you listed in your inventory in step 2 so that like items stay together. Be sure to carefully wrap fragile items in tissue paper, or otherwise cushion them so they stay safe. Make sure everything stays covered to protect it from dust and vermin. Be careful when stacking items not to place anything on top of soft or cardboard boxes containing fragile items. The most important thing is to arrange and store things in a way where everything is easily accessible for next year, and you can find what you want quickly. One of the easiest ways to do this is to label your boxes and other storage containers, and write down on a master inventory what you’ve stored in each container, and where you’ve placed it in storage. Once you’ve taken these steps this year, each year’s Christmas decoration process from now on will be so much easier. You’ll be able to find all the boxes you need quickly and easily, pull out clean undamaged decorations, and enjoy the process of decorating your home for the holidays. I would love to know how this week’s challenge about Christmas decoration storage and organization is going for you. You can tell me your progress or give me more ideas for how you’ve organized this area of your home below in the comments. Your challenge this week is organizing toys and games in your childrens’ rooms, and around the house, so your kids can actually find and play with their toys, and you don’t trip over anything anymore. For the past couple of weeks we’ve been working on all the areas of our kids’ rooms, starting with the closets, and then focusing on their bedrooms. This week we’re finishing the focus on our children’s stuff, at least for a while, by focusing on the area that generally gives most parents (including me) the most trouble — toys, stuffed animals, games, puzzles, and other stuff we have for our kids to amuse themselves with. The steps for this week should be done with your children, if they’re old enough to participate. They deserve to have their opinions listened to and considered in the process of decluttering and organizing their toys, although you, as a parent, also have quite a large stake in the process. Are you new here? 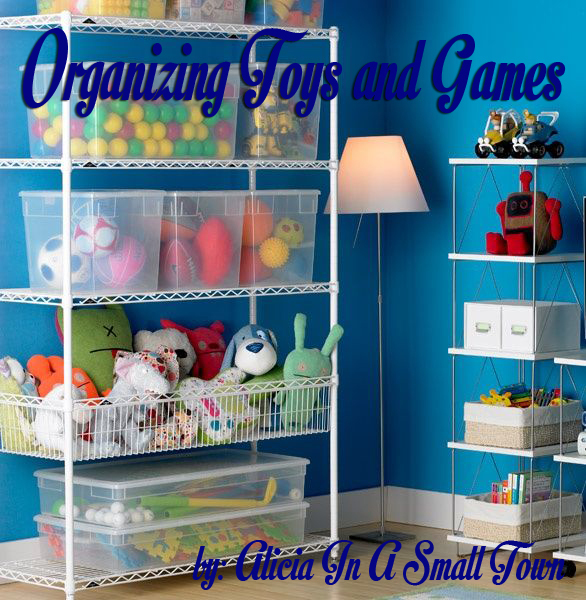 This challenge about how to organize toys and games is part of the 52 Week Home Organization Challenge. (Click the link to learn how to join us for free for future and past challenges if you aren’t already a regular reader).